OhMyVera! 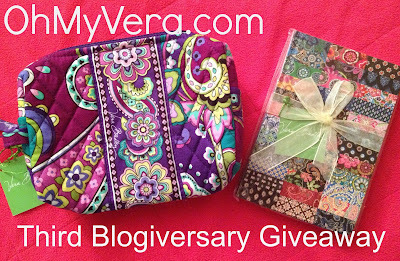 A blog about all things Vera Bradley: Third Blogiversary Giveaway Winner Announced! Thank you to everyone who entered the giveaway for my third blogiversary! The winner is Kimberly M. I will be sending you an email to claim your prize! Congrats! You are one lucky lady.